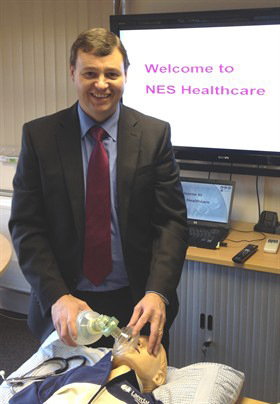 NES is the only company of its type that has developed its own training and assessment course for the doctors to ensure a better quality for our hospital clients. The NES Training Academy is run by highly qualified medical professionals, dedicated to providing quality training for healthcare personnel. The company’s Medical Director, Dr Stephen Drotske (pictured), heads up this division from our fully-equipped training facility in Aylesbury. Stephen has gained over 17 years experience in GP work, Anaesthesia and Accident and Emergency. He has conducted training in Basic and Advanced Cardiac and Paediatric Life Support for over 2000 medical professionals. Stephen works closely with our hospital clients to continually review and develop the Training and Assessment programme. It is our joint aim that this programme will assist doctors to provide an excellent and safe standard of care to the patients, whilst at the same time preparing them thoroughly for their work in the UK Independent Healthcare sector. Only qualified and experienced doctors carry out the training and assessment and the ratio of instructors to candidates is 1:6, with ample training equipment available. Both individual performance and team leadership elements are practised and evaluated.